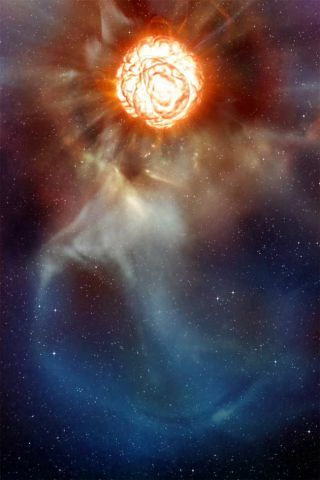 Will Betelgeuse Really Become a Second Sun in 2012? Several online news sites, including the Huffington Post, have reported that the star Betelgeuse will undergo a supernova explosion next year — yes, that's 2012 — and shine as brightly in the sky as a second sun. But according to scientists, it's all nonsense. "Betelgeuse is losing mass, and it will turn into a supernova soon, but that 'soon' means on an astronomical time scale: It's as likely to happen a million years from now as it is tomorrow," University of Illinois astronomer Jim Kaler told Life's Little Mysteries, a sister site of SPACE.com. No one knows quite when Betelgeuse, which is about 10 to 20 times more massive than our sun, will explode. But when it does detonate, the star, which forms the constellation Orion's right shoulder, won't look like a second sun in our sky, Kaler said. "The supernova would hit somewhere around the brightness of a crescent moon," said Kaler, who has focused his research on dying stars since the 1950s. "It would definitely be visible in full daylight, and it would cast shadows. It might scare the crap out of people to be honest, but it would be nowhere near as bright as the sun." And there isn't any reason to be afraid of this particular star explosion. When a star goes supernova, it blasts a huge amount of matter and radiation outward through space. If such an event were to happen within 30 light-years from here, it would significantly damage the Earth's ozone layer and cause mass extinctions. One light-year is the distance that light travels in a year, about 6 trillion miles (10 trillion kilometers). Some supernovas produce gamma-ray bursts as well, which are intense and dangerous blasts of radiation. But Betelgeuse is about 600 light-years away — too far away to threaten Earth — and it will become what scientists describe as a "core-collapse type II supernova." "Those definitely don't produce gamma-ray bursts," said Kaler. So what will happen when Betelgeuse explodes — whenever that may be? "Well, it will make a God-awful mess of the constellation Orion," remarked Kaler. Natalie Wolchover is a Staff Writer for Life's Little Mysteries, a sister site to SPACE.com. You can follow her on Twitter @nattyover.